A Happy Father’s Day to my Dad and all the other Fathers out there! Another sunny day out again, bit warmer and more humid though. 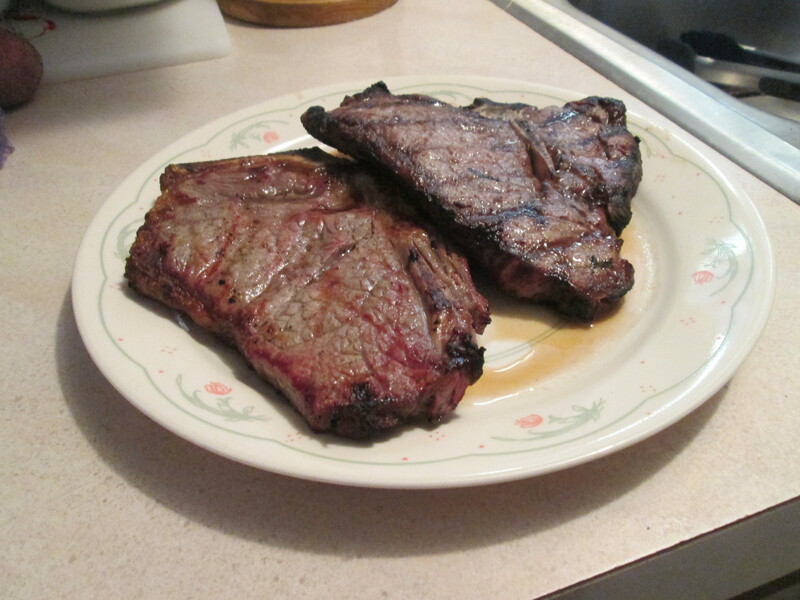 Went to Jungle Jim’s International Market this morning, they had T-Bones on sale and I wanted to prepare them for Mom and Dad for dinner. 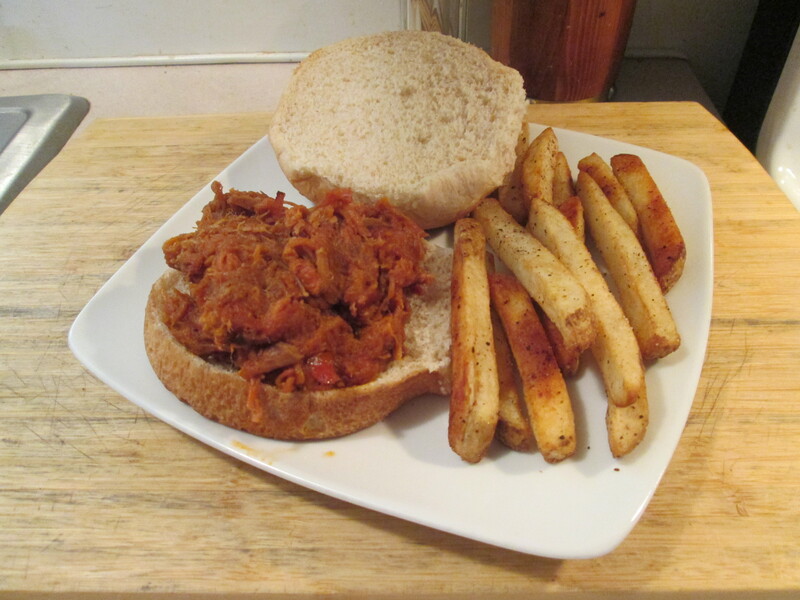 I’ve been wanting some BBQ so for my dinner I prepared Montgomery Inn Pulled Pork BBQ Sandwich w/ Baked Fries. For Mom and Dad I prepared grilled the T-Bone Steaks, Baked Potato, Three Bean Salad, and Baked up some Texas Toast. 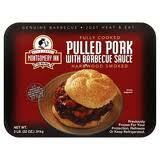 For my BBQ I used the Montgomery Inn Hardwood Smoked Pulled Pork w/ Barbecue Sauce. Montgomery Inn is one of the original Barbecue and Ribs Restaurant in the Cincinnati area. It has some of the finest food, love them Ribs, anywhere! They also sell their Ribs and Pulled Pork and Chicken at all Kroger. So when it’s Pulled Pork I almost always use the Montgomery Inn brand. Anyway you just heat it in a medium sauce pan until it’s warmed and you have BBQ. It’s the perfect combination of the Pork and the mouth watering Montgomery Inn Sauce that makes this so delicious! Plus it’s only 110 calories and 8 carbs per serving. I served it on an Aunt Millie’s Reduced Calorie Whole Grain Bun. I also baked up some Ore Ida Simply Cracked Black Pepper and Sea Salt Country Style Fries. Served these with a side of Hunt’s Ketchup and also had an Ice-Cold Diet Dr. Pepper. For dessert later a Healthy Choice Dark Fudge Swirl Frozen Yogurt. Ohio Festivals for the Week! The Pork Rind Heritage Festival offers family fun, entertainment, and Rudolph Foods’ famous popped pork rinds. The two day event includes live entertainment, corn hole tournaments, a 5K Run, and much more for the whole family. Second weekend in June. Celebrating Wilmington’s claim as the birthplace of the Banana Split in 1907. Music, car show, crafts, games, etc. Cloudy out all day and a bit humid. Took some more items over to a Goodwill Store and ran a couple of errands for Mom and back home. Gave the outdoor grill a good cleaning, I’ll be using it later. 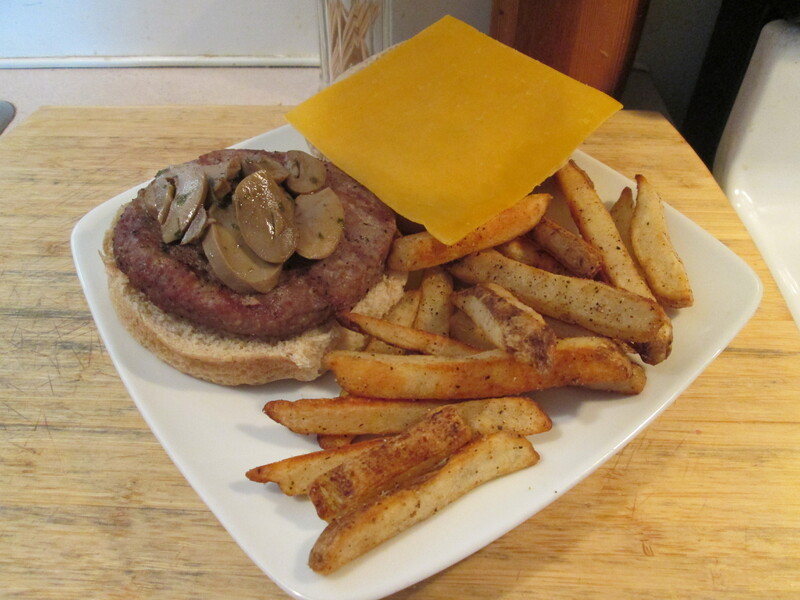 So for dinner tonight it’s a Grilled Smoked Mozzarella Cheese and Mushroom Buffalo Burger w/ Baked Fries. 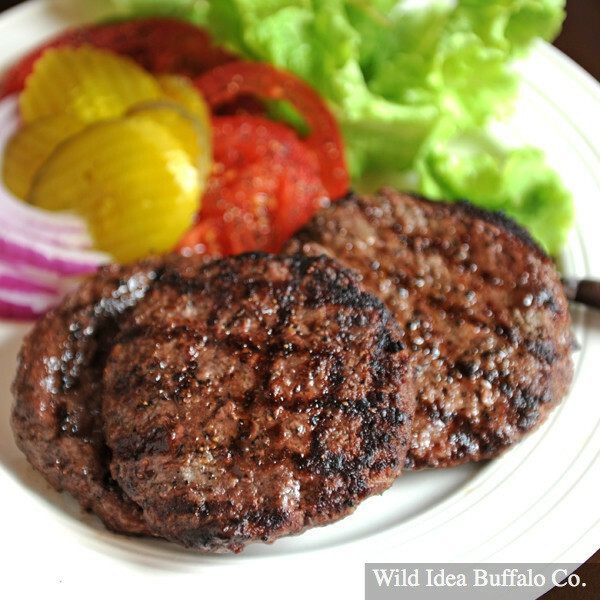 As usual I used my favorite Buffalo, the Wild Idea Buffalo 1/3-Lb Buffalo Burgers. Just love these Burgers. Preheated the Grill and seasoned my Burger with McCormick Grinder Sea Salt and Black Peppercorn. I then grilled it about 3 1/2 minutes per side, and done! I topped it with a slice of Smoked Mozzarella and Sauteed Mushrooms, served it on an Aunt Millie’s Reduced Calorie Whole Grain Bun. Hard to beat a Wild Idea Buffalo Burger! Then for a side I baked up some Ore Ida Simply Cracked Black Pepper and Sea Salt Country Style Fries, served these with a side of Hunt’s Ketchup for dipping. For dessert later a Healthy Choice Dark Fudge Swirl Frozen Yogurt. Third day in a row of beautiful weather! Sunny and the 70’s again. Went to the store for Mom and back home for the day. Stopped by a neighbors for a while and got the cart out for the afternoon. For Breakfast I had Wheat Toast and Turkey Sausage, then for Lunch Tyson Smokey BBQ Chicken Wings, for Dinner I had no clue! One of those days where nothing sounded good. I settled on, Grilled Brats, Chips, and Deviled Eggs. Mom and Dad wanted grilled Hot Dogs and Brats so I thought sounded good as anything. So I fired up the grill and put some Hot Dogs and Brats on. 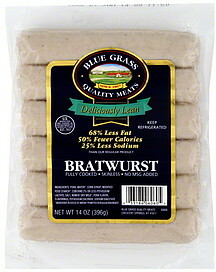 I used Ball Park Hot Dogs, Mom’s favorite, and Blue Grass Lean Bratwurst which are 100 calories and 4 carbs per Brat. Delicious and they cook up great! 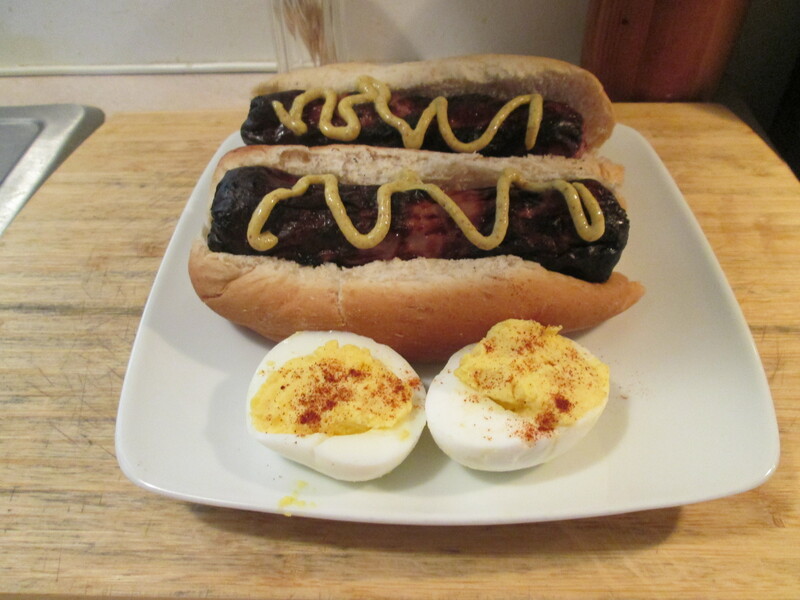 Served them all on Aunt Millie’s Reduced Calorie Hot Dog Buns and topped with French’s Spicy Brown Mustard. Grilled a couple extra Brats for lunch tomorrow. Then Mom had made some Baked Beans and Deviled Eggs. I passed on the Baked Beans, too many calories in the way she made them, but had the Deviled Eggs and Mom makes the best! Nothing had sounded good, but it all came together for a great dinner! For dessert later a Healthy Choice Vanilla Bean Frozen Yogurt. Wow what a gorgeous day to start off the early Memorial Day Weekend! Sunny, not a cloud in the sky, and a high of 70 degrees. A perfect day! Went to Kroger for a few items for myself and my Mom and back home. Did a little price comparison update between Kroger and Walmart, more on the results later. Took the cart out for a while and went down to the lake. 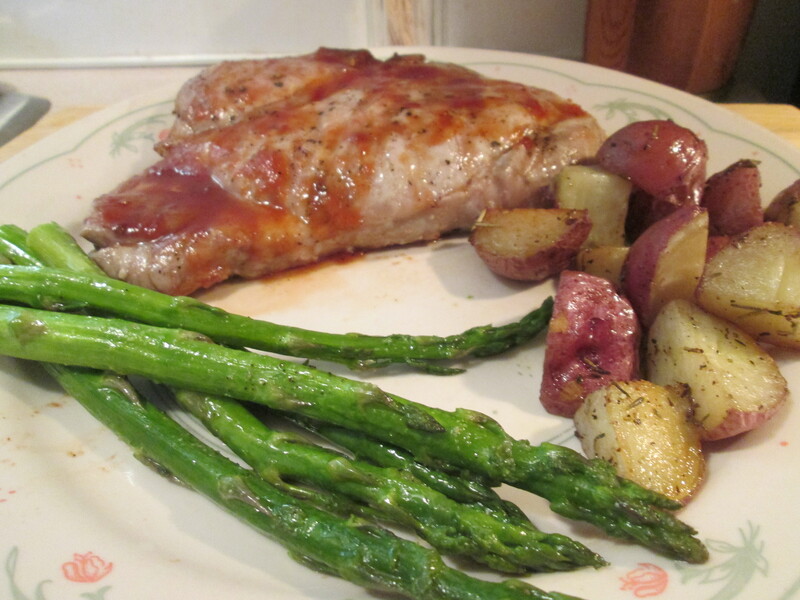 For dinner tonight it was Grilled Pork Chops w/ Roasted Asparagus and Roasted Herb Potatoes. Fired the grill up for part of the meal. 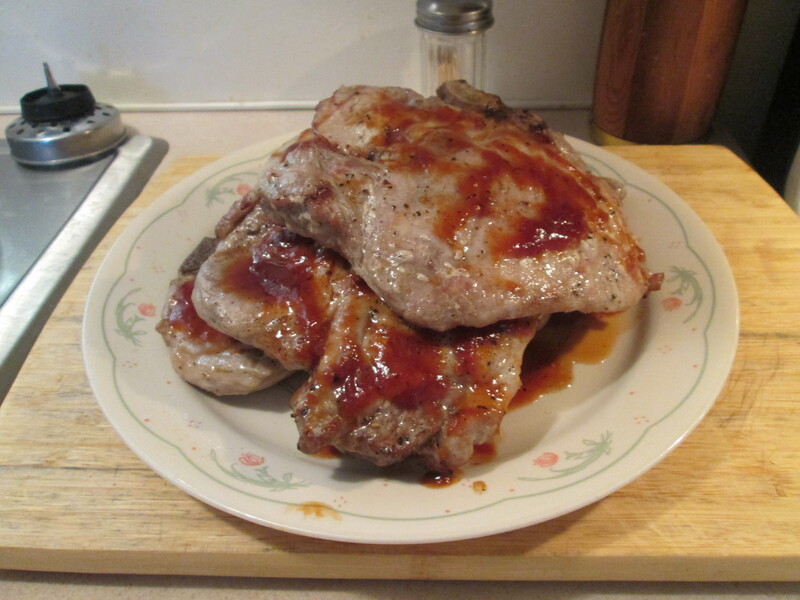 I had bought a package of Kroger Center Cut Pork Chops while at Kroger earlier, beautiful looking Chops! I seasoned the Chops with McCormick Grinder Sea Salt and Black Peppercorn, after seasoning I sprayed a light coat of Pam Cooking Spray on both sides of the Chops. I always do this when grilling to help the Meat not to stick on the grill grate. I grilled the Chops till a thermometer read 150 degrees, grilled about 4 1/2 minutes per side. I flipped them one time and after flipping them I brushed on some JB’s Haug Waush BBQ Sauce on them. JB’s is my favorite BBQ Sauce, it’s a flavorful and a nice thick sauce with several different kinds. The Chops came out moist and full of flavor! Then for sides it was 2 of my favorites, Fresh Roasted Asparagus and Roasted Herb Red Potatoes. For the Red Potatoes, preheat oven to 400 degrees, I needed 1 tablespoon Extra Virgin Olive Oil, 1 tablespoon minced fresh or Dried Rosemary, 1 tablespoon Dried Thyme, Rubbed Sage, and 1/2 teaspoon Sea Salt, and 1/4 teaspoon Ground Black Pepper. 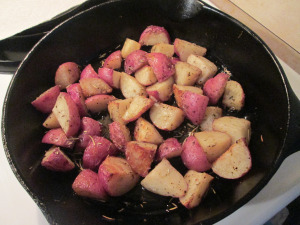 I start by heating up a Cast Iron Skillet on medium heat and as that’s heating up quartered the Red Potatoes. Combined all ingredients in a large bowl and added the Potatoes. Toss to coat Potatoes and add them to the Skillet. Fry them about 4-5 minutes and transfer the Skillet to the preheated oven. That’s why I love using Cast Iron Skillets, from the stove to the oven. I skillet and easy clean up! Bake them for 20 minutes or until their fork tender. With your oven already at 400 degrees you can make the Roasted Asparagus also. To prepare the Asparagus I just needed Extra Virgin Olive Oil, Cloves Garlic (minced), Sea Salt, Freshly grated Black Pepper, Lemon Juice, and Shredded Parmesan Cheese. Rinse clean the asparagus. Break the tough ends off of the asparagus and discard. Lay the asparagus spears out in a single layer in a baking dish or a foil-covered roasting pan. Drizzle olive oil over the spears, roll the asparagus back and forth until they are all covered with a thin layer of olive oil. (Alternatively you can put the asparagus and oil in a plastic bag, and rub the bag so that the oil gets evenly distributed.) Sprinkle with minced garlic, salt, and pepper. Rub over the asparagus so that they are evenly seasoned. Place pan in oven and cook for approximately 8-10 minutes, depending on how thick your asparagus spears are, until lightly browned and tender when pierced with a fork. Drizzle with a little fresh lemon juice and shredded Parm Cheese before serving. Chops, Red Potatoes, and Asparagus, What is not to like! For dessert later a Healthy Choice Dark Fudge Swirl Frozen Yogurt. 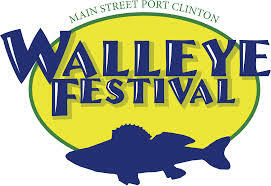 The 34th annual festival will be held at picturesque Waterworks Park on the shores of beautiful Lake Erie in Port Clinton with an array of free live concerts, kids fishing derby, grand parade, educational programs and activities, carnival rides, and food vendors. 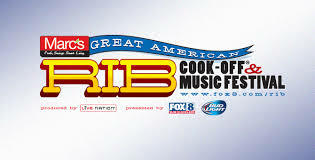 Over 35 of the top BBQ Teams in the nation will set-up on “Pit Row” to compete in the second Buckeye State BBQ Championship. Come watch the competition. Over a dozen Blues bands will perform from Opening to Closing both Friday and Saturday. 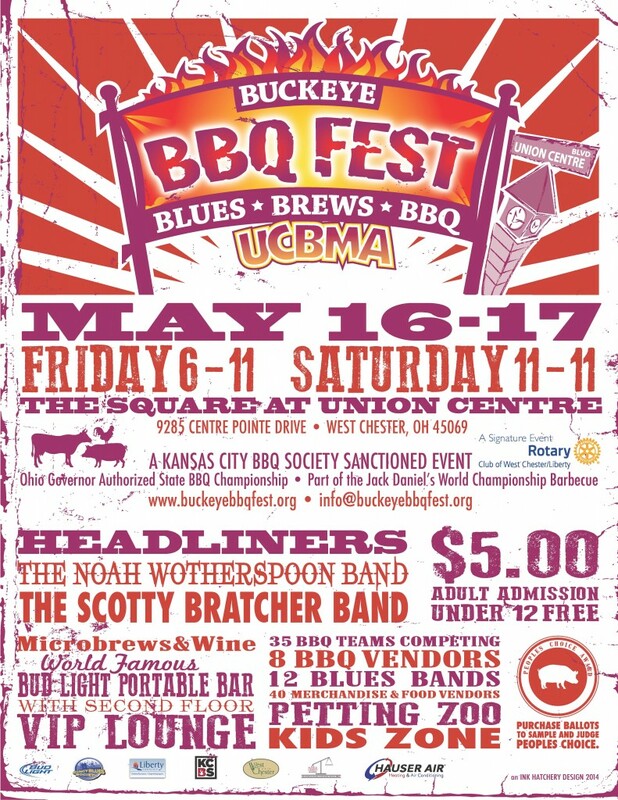 Saturday night features, 2014 CEA Nominated, Scotty Bratcher Band. Inflatable rides, magic shows, storytelling, and a petting zoo… Proceeds benefit local children’s programs. A fundraiser to benefit Diabetes Dayton. . An evening of craft beer, good food & live blues music. Offering a unique selection of draught craft beer for sampling and full tasting with an array of local blues bands live on stage with tasty local cuisine offered for your enjoyment. A celebration of diversity that showcases the food, dancing, music, costumes, and cultural exhibits representing the ethnic backgrounds and cultures of Dayton and the greater Miami Valley. Another morning of a lot rain, and a bit cooler too. Not much to do today. Ran a full scan for the computer and deleted some old pictures and files, and that was about it. For dinner tonight I prepared a Grilled Turkey Burger w/ Baked Fries. 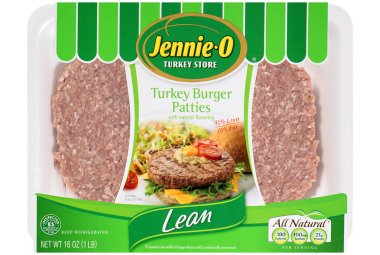 I’m using the Jennie – O Turkey Burger Patties. Fired the grill up and let it heat up and got the Patties ready. Their already pre-made Patties so all I did was season them with Sea Salt and Ground Black Pepper. While I had the grill heated I also grilled Mom and Dad a couple of Brats and some Jennie – O Turkey Franks. 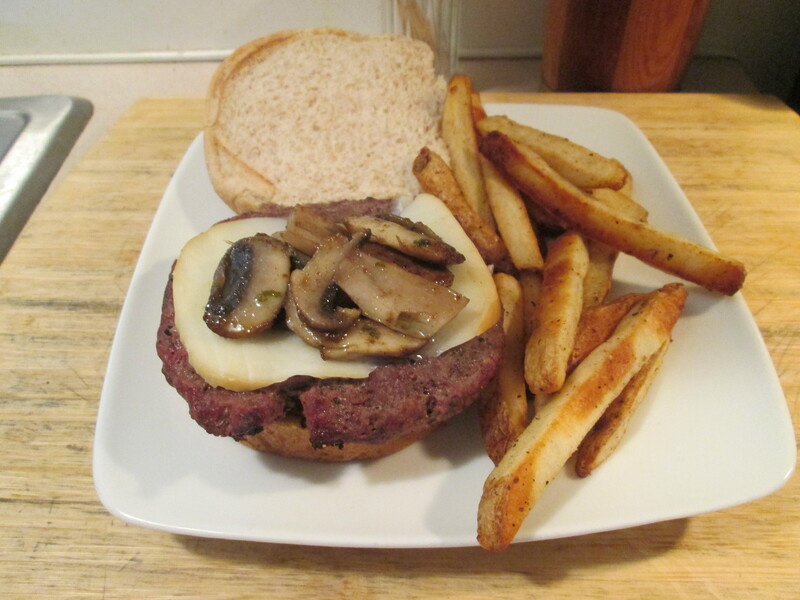 I served the Burgers on Aunt Millie’s Reduced Calorie Hamburger Buns and topped the Pattie with the Sauteed Mushrooms (seasoned with Sea Salt, Rosemary, Parsley, and Roasted Cummin) and a slice of Sargento Ultra Thin Sharp Cheddar Cheese. I also baked some Ore Ida Simply Cracked Black Pepper and Sea Salt Country Style Fries for a side dish. For dessert later a Black Cherry Jello. A chilly start to a Spring Day here today, 36 degrees early this morning! It was sunny out all day but a cool breeze blowing and in the 50’s. Went to one of my favorite grocery stores this morning, Jungle Jim’s International Market. You can spend hours in that store and still not see everything. They had some samples of Bleu Cheese that would just melt in your mouth! Love that store. For dinner tonight it was my favorite Meat, Buffalo or Bison if you prefer. 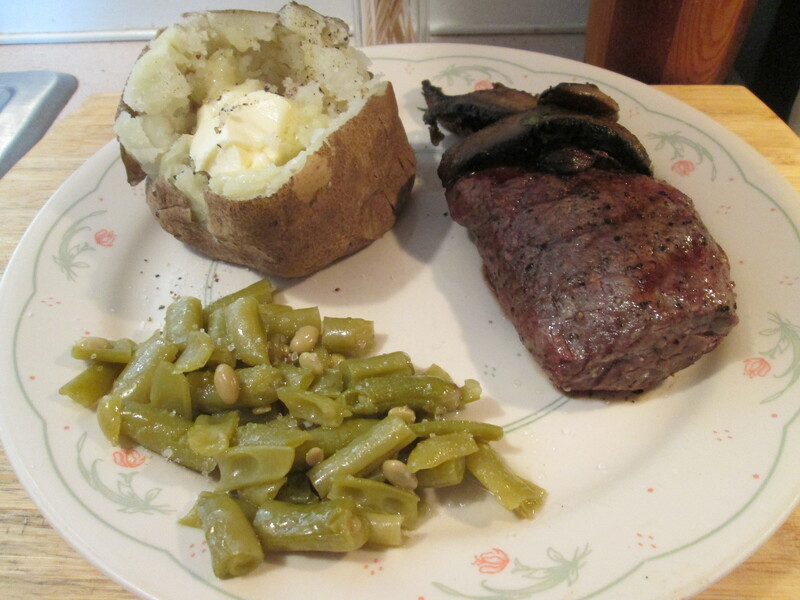 I prepared a Grilled Buffalo Terris Major Steak w/ Sauteed Steak Cut Mushrooms, Baked Potato, and Green Beans. I prepared one of my favorite cuts of Steak, the Wild Idea Buffalo Terris Major Steak. It’s come on of my favorite cuts of Buffalo because it just always so tender. I started by seasoning it with McCormick Grinder Sea Salt and Black Peppercorn then brushing it lightly with Extra Virgin Olive Oil. Fired the grill up and let it get nice and hot, and grilled! Buffalo Meat is very lean and gets done a lot quicker than other Meats. It only takes about 3 1/2 minutes of grilling per side and it’s ready. This one was no exception, it came out medium rare and juicy! I just love the incredible sweet and wild flavor of the Wild Idea Buffalo Meats. I love any Bison or Buffalo but Wild Idea Buffalo is my favorite. Topped it with some Sautéed Steak Cut Mushrooms. For one side I had a Baked Potato, a Steak’s natural companion. Seasoned it with McCormick Grinder Sea Salt and Black Peppercorn, and topped with I Can’t Believe It’s Not Butter. Then I heated some leftover Canned Green Beans. For dessert later a Healthy Choice Vanilla Bean Frozen Yogurt. The second most tender cut on the animal. 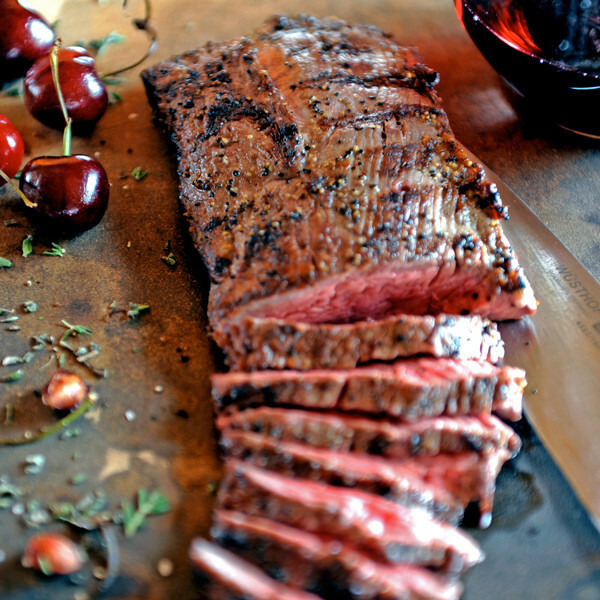 This treasured cut is found in the chuck shoulder.